All of us at BluJay Solutions are saddened by the devastation caused by Hurricane Harvey, and now Tropical Storm Harvey. Our thoughts are with the thousands of people impacted by the storm and its aftermath. We can all agree that the immediate, top priority in the midst of this natural disaster is the safety and well-being of people. Many of our customers and partners also have concerns about how the storm will affect their transportation and supply chain operations. As a Client Services Manager at BluJay, I have had many conversations about this over the past week. I wanted to collect those thoughts and share them with a broader audience. Many of my fellow long-time supply chain professionals remember the aftermath of Hurricane Katrina, and I expect events will follow a similar pattern. We can lean on this experience from 2005 to get a glimpse into our future. The Gulf Coast is going to be cleaning up from this disaster for a long time. As one of my customers put it, “It’s not like things will be back to normal in Houston when the sun comes out.” The storm will affect your business whether or not you have facilities or customers in the area. Refineries in Corpus Christi, Lake Charles, and Houston have about 30% of the nation’s oil refining capacity. The disruption in that area will drive up fuel prices in the short-term for consumers, and for the fuel surcharges your carriers charge you for every load. Historically, these prices return close to normal levels within about 4-6 weeks of the storm. Carrier capacity is going to get tighter. FEMA and other responding agencies are already putting pressure on the market to move equipment and supplies to the stricken areas. I would anticipate it will affect flatbed trailers immediately (heavy equipment), followed by refrigerated (food and ice), and then dry trailers (bottled water and other supplies). It is likely your carriers will not be able to keep their commitments to you in the short-term. Don’t be mad at them! FEMA and other agencies will be begging them to bring needed equipment and supplies, and will pay a hefty premium for this service. Instead, work with your carrier base to navigate around these interruptions, and keep your partner relationships intact for the long-run. Be prepared for transportation costs to go up. Your regular carriers will be less available, and you will need to find other carriers to fill the void, or pay more (good old supply and demand) for your shipments. Economists estimate transportation costs will rise between 5-22% in the short term. Your customer demand will change – think it through. 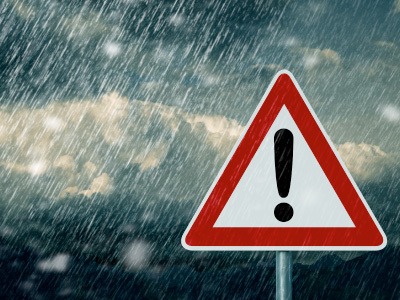 If your customers are in the affected areas, they may cancel shipments in the short-term, but will need to rebuild and replace product lost in the storm. For example, a flooded grocery store will need some time to clean up and make sure the facility is safe again, but eventually will need to stock those shelves. A manufacturing facility may need to replace equipment and raw materials before they can begin operations again. Communicate! You should be adjusting your budgets accordingly, and talking to your carriers, suppliers, and customers to learn from them their short- and long-term recovery plans. If you have additional thoughts or questions about how to navigate through and after the storm, please share them or reach out to your Client Service Manager. Jim Sanborn is Client Services Manager at BluJay Solutions. He works strategically with customers to develop technology and service solutions that deliver value in their supply chains. Jim is also Mayor of the City of Waconia in Minnesota.